Biofouling was a backburner issue until 5 March 2017. On that day the Government of New Zealand ordered the bulk carrier DL MARIGOLD out of NZ waters after the vessel’s hull was determined to be excessively fouled with potentially invasive organisms including barnacles and tube worms. The bulker was not allowed back until it showed that the underwater surfaces had been thoroughly cleaned. This was the first known instance of a vessel expulsion due to biofouling. It was also significant because the NZ regulations – the Craft Risk Management Standard or CRMS – don’t officially enter into effect until May 2018. It was Charles Darwin, following the voyage of the HMS Beagle (1831-1836), who first posited that fouling of the ship’s hull could be a means for the inadvertent transport of marine organisms from one location to another. The ramifications of this concept were not fully appreciated or studied until well into the twentieth century. Some studies now indicate that, at least in certain locations, the introduction of non-indigenous aquatic species has occurred more frequently from biofouling than from discharge of ballast water. The State of Hawaii may have been the first government to officially initiate action to address the issue of biofouling of ships’ hulls when, in 2000, it designated the Hawaii Department of Land and Natural Resources as the lead state agency for preventing the introduction and carrying out the destruction of alien aquatic organisms through the regulation of ballast water discharges and hull fouling organisms. While the Department was authorized to adopt rules in accordance with this mandate and to enforce penalties for violation thereof, to date, little has been done other than public outreach and voluntary efforts due to a lack of funding. After years of study, the International Maritime Organization (IMO) adopted Guidelines for the Control and Management of Ships’ Biofouling to Minimize the Transfer of Invasive Aquatic Species – Resolution MEPC.207(62) on 15 July 2011. The voluntary guidelines provide for development of ship-specific biofouling management plans and record books. The Resolution requested that Member States take urgent action in applying the Guidelines, taking the Guidelines into account when adopting measures to minimize the risk of introducing invasive aquatic species via biofouling. In its 2012 final rule on ballast water management, the US Coast Guard included a requirement for regulated vessels to remove fouling organisms from the hull, piping, and tanks on a regular basis and dispose of any removed substances in accordance with applicable requirements. The vessel’s ballast water management plan is required to include a detailed fouling maintenance procedure. Although the Coast Guard has promulgated no further requirements in this regard, it has issued guidance stating that the biofouling management plan should include the vessel particulars; a description of the anti-fouling system and operational practices and treatments used; a description of vessel operations suitable for the anti-fouling system; a description of the operation and maintenance of the anti-fouling system; safety procedures for the vessel and crew; and recordkeeping requirements. A plan consistent with the IMO biofouling guidelines is considered acceptable. The US Environmental Protection Agency (EPA) implemented its Vessel General Permit (VGP) program in 2009 to minimize incidental discharges from vessels in US waters. Among other things, vessel owner/operators are required to take steps to minimize the transport of attached living organisms when the vessels travel into US waters from outside the US exclusive economic zone (EEZ) or when traveling between Captain of the Port (COTP) zones. A comprehensive annual inspection must be conducted of all areas of the vessel affected by the VGP requirement that can be inspected without forcing the vessel into drydock. Among the areas that must be examined is the vessel’s hull. If portions of the vessel are not inspectable without the vessel entering drydock, these areas must be inspected during drydock and the results documented. The State of California requires that covered ships calling at a California port submit an annual Hull Husbandry Reporting Form, addressing such things as hull coating, hull cleaning, and voyage history. California proposes to adopt in the near future regulations that will be aligned with but make mandatory provisions of the 2011 IMO biofouling guidelines. Included among these requirements will be development and maintenance of a biofouling management plan and biofouling record book, as well as an annual reporting requirement. Covered vessels calling at a California port may be subjected to inspection to determine compliance. Australia has adopted a Maritime Arrivals Reporting System (MARS). The system is intended to provide government officials with sufficient information that they can determine, prior to the vessel’s arrival, the potential biosecurity threat presented by the vessel, including threats due to possible biofouling. This allows inspections to be targeted and potentially may provide a basis for banning a vessel from making a port call. 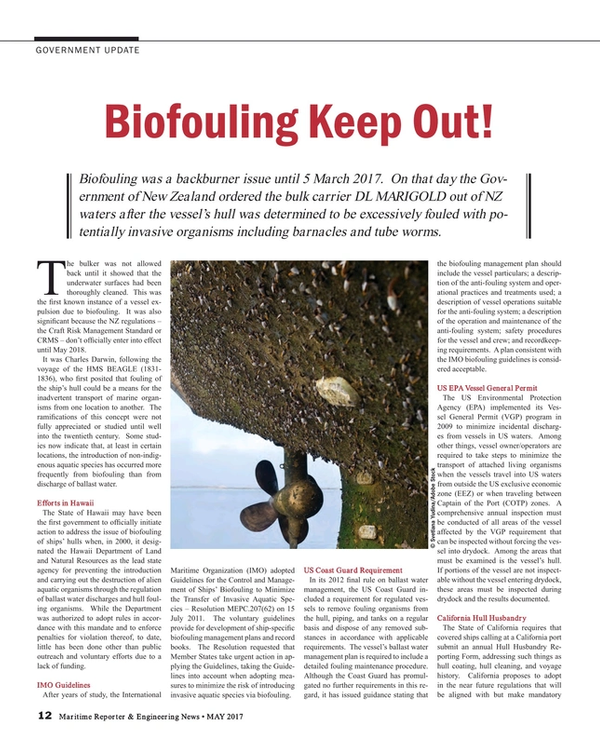 The New Zealand CRMS builds on the 2011 IMO biofouling guidelines, but is much more detailed. It provides that a vessel must arrive with a clean hull. The hull is considered to be clean when no biofouling of live organisms is present other than that within defined thresholds. The CRMS provides for a stringent standard for long-stay vessels – those intending to remain in NZ waters for 21 days or more. Short-stay vessels are allowed a slime layer and goose barnacles on all hull surfaces, as well as green algae growth of unrestricted cover and not more than 50 mm in length and brown or red algae growth of unrestricted cover and of no more than 4 mm in length at the wind and water line. Algae growth on other portions of the hull and in niche areas may be no more than 4 mm in length. There are other conditions, but these are the primary ones. There are three acceptable measures for meeting the CRMS standard. Cleaning of the hull within 30 days prior to arrival is listed first. Continual maintenance using best practices is also acceptable, with following of the IMO biofouling guidelines cited as an example. Finally, the vessel may utilize application of a NZ-approved treatment. Prior to arrival in NZ, the vessel must submit an advance notice of arrival that includes specific biofouling information. The vessel must also retain onboard relevant biofouling information for examination by port state control officers upon request. Vessels deemed to not be in compliance with the CRMS may be prevented from entering New Zealand waters or, if already in NZ waters, directed to depart immediately. Violations may result in a pecuniary penalty of up to $10 million, with a lien against the vessel. Now that New Zealand has crossed the Rubicon and taken direct enforcement action in the biofouling arena, it is likely that other jurisdictions will enter the fray. California is most likely to be next, since it has already proposed such a step. The US Coast Guard will probably examine the biofouling management plans of covered vessels more carefully than it has in the past. Pressure will probably be raised at the IMO to make its guidelines mandatory, although that would be a long-term project. Owners and operators should take steps now to ensure that their biofouling management plans are adequate and are actually being followed.